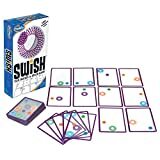 Swish is a pattern recognition card game reminiscent of Set that challenges a player to make matches - dubbed "Swishes" - before opponents. 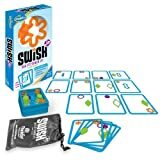 Swish includes 60 transparent cards; each card has some combination of balls and hoops on it, with these items coming in four colors. To set up the game, lay out 16 cards on the table. 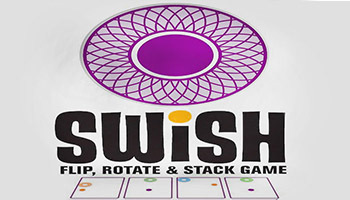 Players simultaneously try to create "Swishes" by spotting two or more cards that can be laid on top of one another in some manner so that every ball fits in a hoop of the same color. Create a Swish, and you claim the cards used, with new cards then being laid out. Whoever claims the most cards wins the game. The game includes varied levels of play so that the spatially clueless can compete against Tetris-heads. Swish is a fun, fast-paced game of spatial thinking! Move the cards in your mind to see the matches. Then make a Swish! 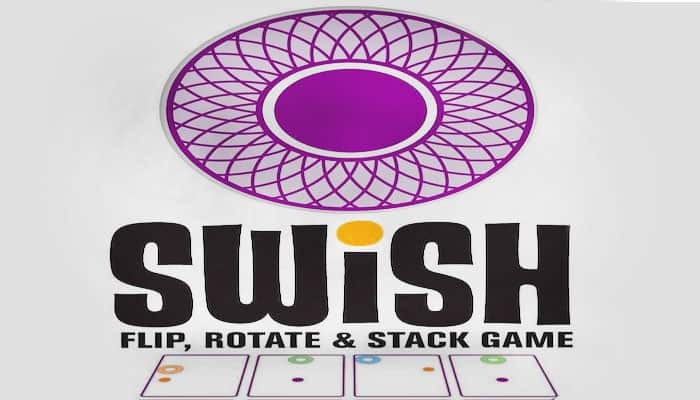 A Swish is created by layering two or more cards so that every ball swishes into a hoop of the same color. The cards may be rotated and/or flipped but must lay on top of each other in the same orientation, and no hoop or ball can be left unmatched. Players look only for Swishes with 2 cards, not for larger Swishes of 3 or more cards. The rules otherwise are identical; this version lets beginners get accustomed to the structure of the game as well as the rotation and flipping of the cards. If there are players of varying abilities, you can level the playing field by limiting more experienced players to find only Swishes of three or more cards.